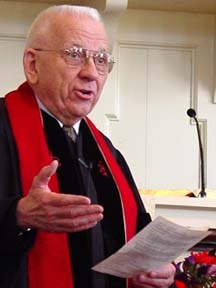 Our Pastor Emeritus retired as settled minister of the Congregational Church of Brookfield in 1997. In his sixth year of pastoring with us the family moved from the old 1812 parsonage farmhouse next to the church to their own home half a mile away, where he and his wife Nancy live at present. When Rev. Desmond was called to serve as pastor and teacher of the Congregational Church of Brookfield in 1975, the family included their two children, Martha and Rachel who transferred to Brookfield Public schools. The girls grew up here, made fast friends here (Rachel, a physical therapist, married a boy from the church, young Harry Gerowe, and they live nearby in Woodbury with their two children Nathan and Margaret. Martha and her husband Douglas Stochel, a New Jersey native, live in Cranford, NJ with their two children Anne and Katherine where she is into computering for ATT). In the over 20 years of his ministry here the "Staff" included various other ordained ministers joined in our pastoral leadership with a variety of titles: Assistant, Associate, Minister of Parish Life, Co-Pastor. A check of the Sunday bulletins reveals that Pastor Desmond's title remained "Minister of Word and Witness" for most of his time with us. Since his departure from responsibilities pastoring our congregation "Des", as he is affectionately known, continues his ministry in retirement as occasional supply preacher in area churches and workshop leader for church retreats and conferences, as invited. He and Nancy produced the "Taste of Punch and Judy” at our 2007 Yankee Fair and he continues to pursue his hobby of Magical entertainment as Desmond - the Whiz of a Wizard. Nancy pursues her interest in Family History and her gift in landscape painting. In 2006, Des observed his Golden Jubilee of Ordained Ministry by celebrating the 50th Anniversary year of his Ordination to Christian Ministry on November 26, 1956 in Manchester, New Hampshire. He envisioned preaching for each of the five churches he served during the time of his settled ministries and our own church was the first to accept his offer. During the "Golden Jubilee Tour" he visited his former parishes in Danbury, CT, Newington, NH, Verona, NJ, and finally, in 2007, Manomet, MA.